Hello Ben, this is the most interesting thing which we are awaiting since a long time. I will quickly check this multi blog BE feature and will do some R&amp;amp;amp;amp;D.
I am still not clear on Host Name &amp;amp;amp;amp; Virtual Path, can you please elaborate it more ? May be in next or separate post. Actually I have only one question is that with out creating the subdomain on the server can we browse parent blog using subdomain ? Can you please clarify it ?? It is required that (a) DNS for the domain name or subdomain name is setup, and (b) IIS is setup to respond to that domain name or subdomain. BE.NET will look at the incoming request to see what the domain/subdomain is, as well as look at the path to determine which blog instance the request is for. In order for BE.NET to be able to see the incoming HTTP request to make this determination, DNS/IIS must be setup so requests actually are handled and routed to the BE.NET application. Hopefully this makes sense. Thanks. Yeah Thanks, Now its clear. Hello - on the multiple blogs funcations, how about multiple domains? I have several sites I would like to control under on BE instance (will start with a fresh installation). I have full access to my own server and as such direct access to IIS 7.5. Would you provide some insight as to how this would be handled in the control panel? Hi John, yes you can do that. Is it possible to use Windows LiveWriter to publish to multiple blogs in one instance? Hi Mack. I don't think I tested this specifically, but yes, that should work. 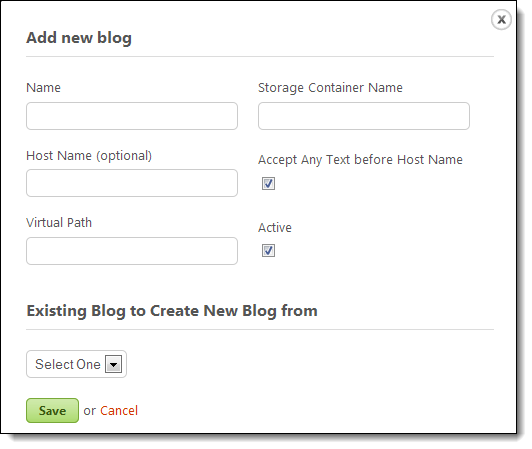 Each blog instance would be setup as a separate account within WLW. When you setup the WLW account, you give it the blog instance homepage URL. So you would just enter the homepage URL of a particular blog instance, and WLW will communicate w/ just that one blog instance. When WLW communicates w/ the blog instance, because it will be communicating w/ the blog instance via the blog instance's unique URL, BlogEngine will recognize that the WLW requests are on behalf of that particular blog instance.